In 1996 Metro Machine leased a portion of the Philadelphia Naval Business Center, formerly the Philadelphia Navy Base, with berthing and dry-docking capabilities in excess of 1,000 feet. Metro Machine's Philadelphia Naval Shipyard (PNSY) facility includes building 669, Dry Dock 2, Pier 5, and option on Dry Dock 3. Dock 2 is suitable in general for docking Cruisers, Destroyers and Frigates. It is made of granite and concrete. The dry-dock entrance enclosure is a Caisson. The facility has Main and Auxiliary cranes capable of Max lift of 50 long tons and 15 long tons as well as Whip type cranes for 5 long tons. There is 35 feet of water alongside the East Side of Pier 5. Ship moorings for 800 foot long ships are fitted on Pier 5. On 29 September 1999, Navy awarded four Indefinite Delivery/Indefinite Quantity (IDIQ) contracts under Phase One of the Ship Disposal Project (i.e., the pilot phase). Metro Machine will dismantle the ex-USS Blakely at its shipyards in Philadelphia and Chester, Pa. Camden Iron & Metal Inc., Camden, N.J., will broker the scrap sales. Philadelphia NSY is on League Island in the Delaware River in Philadelphia. The original naval yard was established in 1801. The yard underwent numerous upgrades, primarily in the early part of the 20th century. In 1917, the Naval Aircraft Factory was established on the island. After World War I, the factory focused on the development and manufacture of experimental aircraft and aircraft accessories. During World War II, the shipyard constructed 53 ships and repaired 574. The workforce was greatly reduced after World War II, from 40,000 to 12,000. The Naval Aircraft Factory was redesignated the Naval Air Material Center in 1943, and became the Naval Air Engineering Center in 1963. In 1974, the Naval Air Engineering Center was relocated to Lakehurst, NJ. The last ship completely built at the yard was finished in 1970. In 1987, fleet carriers underwent service life extension at the yard. The Navy Intermediate Ship Maintenance Facility (NIMSF) continued to store decommissioned and mothballed ships after the shipyard closed in the mid-1990s. In storage at the shipyard as of late 1995 were two battleships, one heavy cruiser, two aircraft carriers, two amphibious assault ships, two AEs, two AOs, two AORs, one AFS, four CGs, nine DDGs and seven FFs plus numerous small auxiliaries. These included the amphibious assault ships GUADALCANAL (LPH-7) and IWO JIMA (LPH-2); aircraft carriers SARATOGA (CV-60) and FORESTALL (CV-59); and the battleships IOWA (BB-61) and WISCONSIN (BB-64). Ex-USS Saratoga (AVT-60), one of the inactive aircraft carriers mothballed at the old Philadelphia Naval Shipyard, was towed out of Philadelphia for the last time 03 August 1998 by the Fleet-tug USNS Powhatan (T-ATF-166). Saratoga was the first of three deep-draft vessels to be relocated to Newport, RI, for storage. The relocation was done as part of the lease arrangement between the Navy, the City of Philadelphia and Kvaerner Philadelphia Shipyard and as a result of BRAC-91. Saratoga arrived at the Naval Education and Training Center's Pier 1 in Coddington Cove on 07 August 1998 returning a Navy ship presence to Newport that has been missing from that historically Navy town for many years. ex-USS Forrestal (AVT/CV 59) and ex-USS Iowa (BB 61) joined Saratoga in Newport in mid-September 1998. None of the ships will be open to the public. 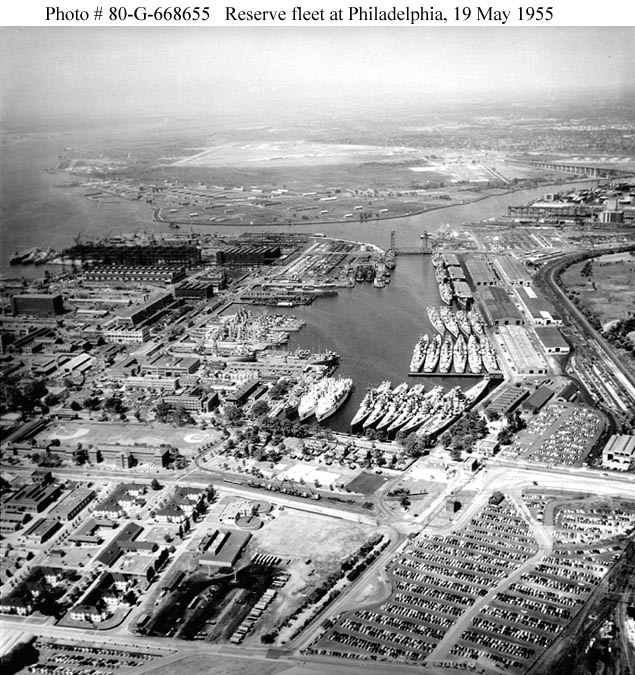 Philadelphia Naval Shipyard was the first Naval Shipyard in the Nation. In 1799 Congress authorized $522,678 in funds for the purchase of land to establish the Philadelphia Naval Shipyard. The shipyard was originally located in the Southwark region of Philadelphia. However, with growth of the city, the shipyard was relocated to its present site. For many years, the workload at the shipyard consisted primarily of new construction and conversions of ships. For example, during World War II the battleship WISCONSIN, the aircraft carrier ANTIETAM, and the cruisers CHICAGO and LOS ANGELES were launched in a period of seven months. However, during the late 1960s at the direction of Defense Secretary McNamara the Navy gradually phased out of the new construction business, turning this work over to the private sector. The last ship built at the Philadelphia Naval Shipyard was the command ship USS BLUE RIDGE in 1970. Subsequentlly, PNSY was assigned ship repair and overhaul work. PNSY specialized in fossil-fueled, sophisticated surface combatants. Its areas of expertise evolved to include high pressure steam turbine engines, electronics, and combat systems. PNSY was typically assigned those ships requiring extensive electronics and combat systems work. PNSY also performed the the CV SLEP and new threat upgrades. SLEP (Service Life Extension Program), a multi-billion-dollar rebuilding of the Navy's eight conventional aircraft carriers, accounted for half of the shipyard's workload during the 1980s. New threat upgrade is a sophisticated electronics package and major ship alteration that makes older cruisers and destroyers compatible with the newest Aegis class cruisers. PNSY is located at League Island, Pennsylvania at the confluence of the Delaware and Schuylkill Rivers. The shipyard occupies 904 acres with the industrial area comprising 360 acres. These are 390 permanent, semi-permanent, and temporary buildings, accounting for over 7M SF of shop space. The shipyard has five graving dry docks and 29,044 lineal feet of berthing space. The 1991 Defense Base Closure and Realignment Commission recommended that the Philadelphia Naval Shipyard [PNSY] be closed but acknowledged that PNSY would perform the Service Life Extension Program for the USS. Kennedy from September 1993 until mid-1996. The work on the USS. Kennedy subsequently changed to a 24-month complex overhaul, which Congress required to be performed by PNSY. The Secretary of Defense concurred in this plan in September 1991. KENNEDY completed a two-year comprehensive overhaul in the Philadelphia Naval Shipyard on September 13, 1995. In order to maintain this trade skill mix, particularly during a large and complex overhaul such as an aircraft carrier, the shipyard needed to maintain an amount of ship repair work which will sustain a workforce slightly larger than and equally diverse to that required for the peak performance period of a carrier overhaul. An analysis of the history of carrier overhauls at Philadelphia Naval Shipyard shows that work on carriers has averaged 66 percent of the total ship repair work in the yard at any one time over the 11 years from 1981 through 1992. During the 1990 and 1991 carrier work averaged 77 percent of the total ship repair work in the yard at any one time. Prior to the cancellation of the project, some 88 percent of the ship work to be done at any one time during the first 6 months of 1993 was to have been on one carrier, the USS Forrestal. Forrestal arrived at the Philadelphia Naval Shipyard in September 1992 for her scheduled 14-month complex overhaul, but the overhaul was discontinued in March 1993 when the Forrestal was designated for decommissioning. Prior to closure the civilian employment in the shipyard was approximately 7,000 employees with an annual payroll of $263M. On 02 March 1994 the senior Senator from Pennsylvania [Mr. Specter] personally argued the case of Dalton versus Specter before the Supreme Court of the United States. This case was originally filed by Senators Specter, Wofford, Bradley, and Lautenberg, as well as other Pennsylvania, New Jersey, and Delaware elected officials and various unions, to protest the alleged violations of law in the procedures followed by the Base Realignment and Closure Commission [BRAC]. The BRAC recommended closing the Philadelphia Naval Shipyard . To effectively and humanely deal with the shipyard's closing while continuing to meet the needs of the US Navy, the Philadelphia Naval Shipyard formed a partnership between its own Human Resources Office, Philadelphia Career Transition Center, the Navy's Office of Civilian Personnel Management- Eastern Region, the Philadelphia Private Industry Council and the State of Pennsylvania Dislocated Workers Unit. To meet both its customer's and its employees' needs, the closing of the shipyard could not be accomplished by "routine" Reduction-In-Force (RIF). To maintain the workforce needed to complete the rehauling of the USS Kennedy, employees' needs for a smooth transition into new careers were met through special funding for retraining and counseling services ranging from retirement planning, financial planning, and planning for a new career. The program was so effective and successful, that it has served as the model for subsequent DoD base closings. After months of intensive negotiations, on 21 October 1997 Pennsylvania Govenor Tom Ridge and Philadelphia Mayor Rendell signed an historic agreement with Kvaerner to to renovate and modernize the publicly owned yard. The shipyard project includes a public investment of $396 million in capital funding from federal, state and local sources. Public bodies will retain ownership in the yard and can recapture it should Kvaerner significantly reduce ship production. Kvaerner will design and manufacture container and tanker ships using the world's most advanced robotics and software technology. Kvaerner is Europe's largest commercial shipbuilder, and an international engineering and construction company widely recognized as a world leader in high-tech transportation. The Philadelphia facility is Kvaerner's first American shipyard, and in the summer of 1998 the company established its North American headquarters in Philadelphia. A Master Agreement establishing Kvaerner Philadelphia Shipyard Inc. was signed in December 1997, and Kvaerner signed a long-term lease for the shipyard site in April 1998. Ship-construction startup is slated for June 1999, and the first ship to be delivered in early 2001. Kvaerner is committed to invest $245 million to modernize the yard over the next 15 years and purchase the first three ships at cost. Kvaerner will invest $45 million in yard construction in the first five years, $120 million in yard modernization over the subsequent ten year period, purchase three of the nine ships to be constructed during the first five years of yard operations at a cost of $80 million, and make available ship designs, software and research and development valued at $75 million. The company is responsible for up to a $20 million penalty if it fails to reach agreed-upon employment levels, and is responsible for all cost overruns associated with construction and operation of the shipyard. Kvaerner's goal is to create a yard that is 10 to 12% more productive than world-class standards. The yard will be the leading producer of container and tanker ships for the US market and be capable of competing for international business in Europe and Asia. The yard will also have the capacity to expand to build cruise vessels for the US market. In addition to the 1,000 direct Kvaerner and 1,000 direct supplier jobs, the project is expected to create 400 to 600 construction jobs and 3,400 indirect jobs throughout the region and state -- a total job impact of at least 6,000 jobs. This includes 50 new jobs at Kvaerner's Pittsburgh facility. Preliminary development work at the yard started in January 1998. Since May 1998, Philadelphia Shipyard Engineering, a joint venture among several local architectural and engineering firms, has handled the engineering and design of the yard. On 19 May 1998 12,000 former defense workers in the Philadelphia region were invited to apply for jobs at Kvaerner. Skill assessment and individual training plan development for the applicants began in September 1998, and Kvaerner initiated interviews with engineers, planners and key production specialists in anticipation of hiring. On 04 September 1998 Gov. Ridge joined Kvaerner officials and union leadership from the Metal Trades Department of the AFL-CIO in signing a labor agreement to return jobs to the shipyard. The five-year collective bargaining agreement will cover approximately 1,000 machinists, welders, iron workers, sheet-metal workers, electricians, carpenters, painters and pipefitters. Kvaerner has expressly committed to building a supplier base within the state and region, including opportunities for steel plate and structural items, cable and pipe fittings, large diesel engines and electronic components. Kvaerner is an industry leader in just-in-time production, creating extensive opportunities for building a supplier industry to produce the 30,000 parts and components used in constructing a ship.